When was the Lovell Telescope at Jodrell Bank first switched on? 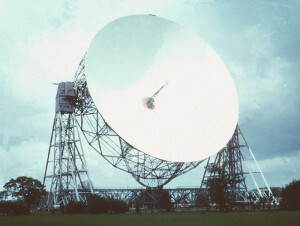 The Mark I Telescope at Jodrell Bank (now the Lovell Telescope) as it looked after completion in 1957. I don’t know where that claim originates but I’m pretty sure it’s not true. This movement in azimuth was not powered by electric motors, they had not yet been fitted. This was the first movement in azimuth under power. This was the first movement in elevation. Watch “Listening To The Stars”, a Pathe newsreel from 1957 June 27th. The first signals received by the telescope were with the telescope pointed straight up and not in movement. Although they continued with measurements through August, the drive system was not connected to the control room and the telescope was far from fully steerable. Progress was painfully slow. There were serious engineering problems with the telescope, the project faced huge debts and the Press were sniping from the sidelines. Despite “a state of siege” from the Press developing around the Observatory and his home following the launch on October 4th, Lovell had no intention of trying to receive the signal from the satellite itself – that didn’t need a 250-foot telescope. But in a series of phone calls from “various places in London” he learnt that there was no defence radar in the free world capable of detecting the launch rocket, an intercontinental ballistic missile – “The miracle was waiting to be grasped…Work which had previously been thought to take months was then completed in forty-eight hours”. So, when was the telescope first “switched on”? Was it when it first moved, unpowered on February 3rd 1957, or under power on June 12th? Or when it first received radio signals from the Universe on August 2nd? Or should we wait until it was moving under full automatic control and used with a radar on October 10th? If I was forced to pick, I think I’d go for August 2nd – the occasion of “first light”, always an auspicious occasion for any telescope and generally regarded as its first use. So, despite claims circulating on the internet, I don’t think October 11th is the date the telescope was first switched on. But it was right in the middle of probably the most important week of the telescope, when it drew the attention of the world by tracking the launch rocket of Sputnik 1 at the dawn of the space age. Not a bad claim to fame! …and how did they know in which direction to point the bowl? …for Sputnik rocket you mean? The orbit was known – in fact the rocket was visible to the unaided eye at night (much like the international space station and other satellites are today) e.g. see http://history.nasa.gov/sputnik/harford.html and http://claudelafleur.qc.ca/Spacecrafts-1957.html . The key point here is that it was detectable by radar. Previous Previous post: Hello Moon, can you hear me?